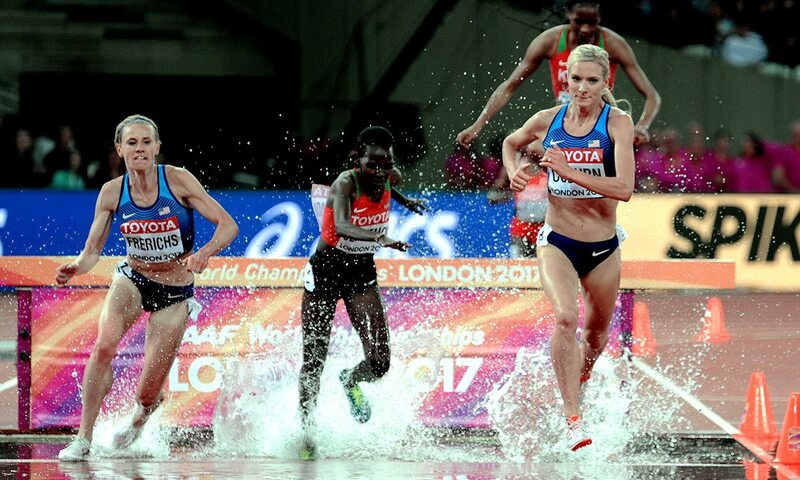 Emma Coburn claimed a record-breaking 3000m steeplechase victory at the IAAF World Championships on Friday, leading a US one-two in London. Running 9:02.58, the Olympic bronze medallist broke the world championships record and also improved her own American record as Courtney Frerichs was also inside the previous record time with 9:03.77 for silver. Kenya’s Hyvin Kiyeng Jepkemoi claimed bronze in 9:04.03. The USA team is having a great Championships but not many would have predicted a US top two in an event that saw thrills and spills and even a detour as one runner took a wrong turning. The race started slowly for a lap but seemed to advance in pace on the second lap. That must have distracted Olympic fourth-placer Beatrice Chepkoech as she absent-mindedly did not turn into the water jump and became one of the first runners to effectively take a wrong turning in a track race. On seeing everyone else jump inside her, she stopped and then turned to run back for 30 metres the opposite way before going over the water jump, well behind everyone else. Sprinting madly, incredibly she came through the field and actually got back into contention despite losing well over six seconds. Ahead, world record-holder and Olympic champion Ruth Jebet pushed on past 1000m in 3:02.74. Then a big fall caused further chaos. Jebet pushed on even more during the second kilometre which she reached in 6:03.60. Despite the fast pace, she still had five other contenders following her. The dangers looked to be defending champion Hyvin Jepkemoi, Coburn and world junior record-holder Celliphine Chespol. Also there was Frerichs and, amazingly, Chepkoech. Frerichs, 11th in the Olympics but 16th in her only Diamond League of 2017 in Doha, and with a 9:19.09 PB, was not expected to be a factor. By the last lap, Chespol was fading and then Jebet dropped back as she paid the price for setting a pace which had made the race a test of strength rather than speed on the last lap. Down the back straight, Jepkemoi led and it was Frerichs who moved up with Coburn well placed. Over the last water jump as Chepkoech finally had to let go, the two Americans took it better either side of Jepkemoi. It was then Coburn who kicked well and went away, while Frerichs held off Jepkemoi to be a delighted runner-up before the two Americans embraced each other on the ground. “This is incredible and better than I could ever have imagined,” said the winner. Kenyan-born athletes took the next four places. Jepkemoi was close behind Frerichs, while Chepkoech was fourth despite her detour. Bahrain’s Jebet finished fifth and Chespol sixth. Earlier on there had been dramatic happenings over a different kind of barriers in the women’s 100m hurdles semi-finals. The 2012 Olympic champion Sally Pearson carried on her good form with an even more impressive 12.53 to win the first semi by two metres from Olympic silver medallist Nia Ali on 12.79. Netherlands’ Nadine Visser, seventh in the heptathlon, was a clear third in 12.83 ahead of Jamaican Megan Simmonds. Visser surprisingly made the final as a fastest loser. USA’s Christina Manning won the second semi in 12.71 from world bronze medallist Alina Talay’s 12.85. Yanique Thompson was third in 12.88. The big shock, though, was defending champion Danielle Williams, who had run an impressive 12.66 in the morning, exiting with a fifth place 13.14. The final heat almost saw a bigger shock as world record-holder Kendra Harrison smashed the first hurdle and lost ground. She looked out of it halfway but she recovered with a strong finish and a late lunge got her third place in 12.86 and she qualified as a fastest loser by a hundredth of a second. Harrison said: “I made the final so I’m just glad to have got through. I think that first little hiccup threw me off, but I just tried to make it through. I’m excited for the final, it’s my first one, and I’m ready to come out here and get the job done. The race was won by 2008 Olympic champion Dawn Harper-Nelson of the United States in 12.63 from Germany’s Pamela Dutkiewicz on 12.71. Just missing out in fourth was Norwegian Isabelle Pedersen. The two British athletes, Tiffany Porter and Alicia Barrett exited in the morning’s heats.